Vet-I-Care is funded entirely by the generosity of our community and through our fundraising events. In loving memory of our miniature Schnauzer Benny we have designed a beaded bracelet with a St. Francis charm. A portion of the proceeds from these sales will go to Vet-I-Care, a 501 (c) (3) non-profit charitable organization committed to helping families secure the resources required to provide much needed specialty and emergency care for their pets. Your purchase will come in a canvas drawstring bag along with an information card. This bracelet makes a great gift for any animal lover. Shop Now! 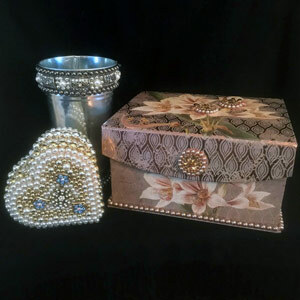 Head over to Beauteous and the Beads and view Dr. Laura Culbert's beautiful beadwork. 20% of your purchase will be donated to the Vet-I-Care foundation. You can contact her through her email lculbert@northstarvets.com or visit her Facebook page.